My favorite rule of thumb, and one that I have used with great success many times, is to 'sail the longer tack first.' This is a simple, nearly foolproof guideline that is easy to use and often comes with great results. When you're racing upwind, the 'longer tack' is the one on which you must spend more time to get from where you are to the windward mark. There are many reasons why one tack may be longer than the other. Most often, this happens because you have sailed away from the middle of the course. For example, if you sail toward the left side of the beat you might have 4 minutes left on starboard tack and 8 minutes left on port tack before reaching the windward mark. In that case, port is obviously the longer tack. Other reasons for unequal tacks include windshifts, a crosscurrent and a windward mark that was not set to windward. The longer tack is the one on which your bow is pointing closer to the windward mark. Sometimes it is easy to judge this by looking at where other boats are pointing on each tack. If you have instruments, or even a compass, you can calculate the longer tack mathematically. Besides figuring out which tack is longer, it's important to know roughly how much longer it is than the other tack. For example, will you have to spend 10 minutes on one tack and 2 minutes on the other? Or just 7 minutes on one tack and 6 on the other? The more skewed the tacks, the more critical it becomes to sail on the tack that is longer. If one tack is much longer, there is a high probability that it will be better to get on that tack right away. But if the tacks are very close in length (which is probably the case if you have a hard time figuring out which tack is longer), there may be no advantage in sailing one tack just because it's a little longer. 'Sailing the longer tack first' is a rule of thumb that works most of the time. However, like all such guidelines, it is not meant to be a replacement for figuring out what the wind is doing and making your own strategic plan to handle the particular wind conditions you are facing. For example, if it's light air and you see more pressure to the left, you should probably sail that direction on starboard tack even if port tack is a lot longer. However, when you are not so sure about what the wind will do next (and this is the case even for top sailors much of the time), then you can rely on rules of thumb like 'sail the longer tack first.' This principle works because when the wind might shift in either direction it's better to stay away from the layline. By sailing the longer tack first, you head toward the middle of the beat rather than the closer layline. Sailing the longer tack first is a good rule of thumb when you are not sure which way the wind will shift next. The longer tack takes you away from the layline and gives you a better chance of gaining if you get a windshift before you reach the windward mark. 1) The distance you must sail on one tack is substantially longer than the distance remaining on the other tack. For example, if you have 7 minutes to sail on starboard tack and only 2 on port (A), it's very likely that sailing the longer tack first will be better. But if you are closer to the middle of the course with 4 minutes to sail on one tack and 3 minutes on the other (B), there may not be much advantage in sailing the longer tack first. 2) You are fairly far from the mark. The closer you are to the mark (C), the less of an advantage you'll get from sailing the longer tack first. That's because the wind is less likely to shift during the short time before you round the mark. In this case it's often best to minimize the number of tacks you make and to position yourself ideally relative to the boats around you. For the same reasons that you should normally sail the longer tack first on a beat, you should also sail the longer jibe first on a run. Getting to the downwind layline too early has all the same problems - the risk of sailing extra distance, possible bad air and the inability to play future windshifts (when you're not sure what the wind will do). In fact, this rule of thumb may be even more important on runs than beats because it's easier to overstand downwind. 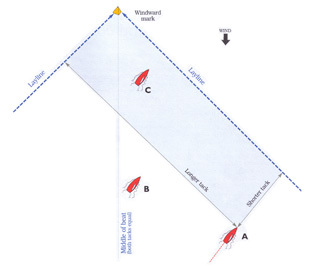 Most boats have narrower jibing angles than tacking angles (right), so when you round the windward mark you are already closer to a layline. All you need is a slight skew in the course, a windshift, pressure increase or a crosscurrent and you'll be at layline before you know it. 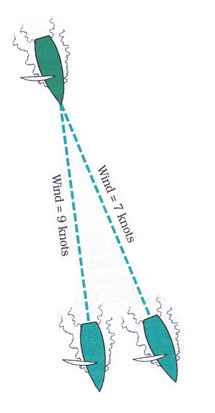 LEFT: Even a small increase in wind velocity can have a large impact on your downwind angles. Therefore, you have to allow for this when positioning yourself on the run. If you get too close to a layline and get a puff, you will be overstanding the leeward mark. 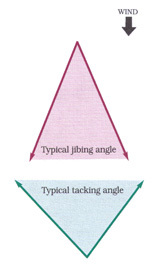 RIGHT: Boats with symmetrical spinnakers typically have narrower jibing angles than tacking angles in almost every wind velocity. So it's easier to get to a downwind layline, especially in breeze when the jibing angle is very small. Over the course of many races in the past, this strategy has proven to work more often than not. In other words, it gives you a higher probability of success, which is very important when you are trying to minimize your exposure to risk. The probability that this rule of thumb will work goes up as: a) the tacks become more uneven; and b) you are farther from the mark (see “Playing the odds”). If you are quite far from the windward mark and the tacks are quite skewed, it is very urgent to sail on the longer tack. Note that if you have a cross-current (a current the runs perpendicular to the wind), this will often make one tack longer than the other, sometimes by quite a bit. In that case, it may be better to sail the up-current tack first. This is not because there is any inherent advantage to being up-current - it just keeps you closer to the middle of the course, which is better when you're not sure what will happen next with the wind.